New playground apparatus set up under park’s Old Spruce Tree’s root system severely hacked away on one entire side, couldn’t this have been avoided working to preserve established root span area in combination with planning new equipment? 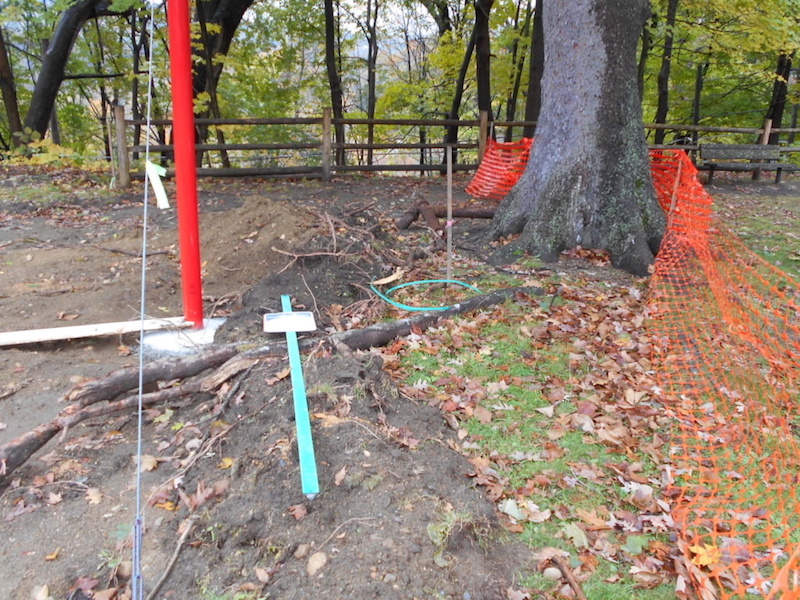 Poor planning of placement and excavation work by rec park. In the old days, a tree was a playground. 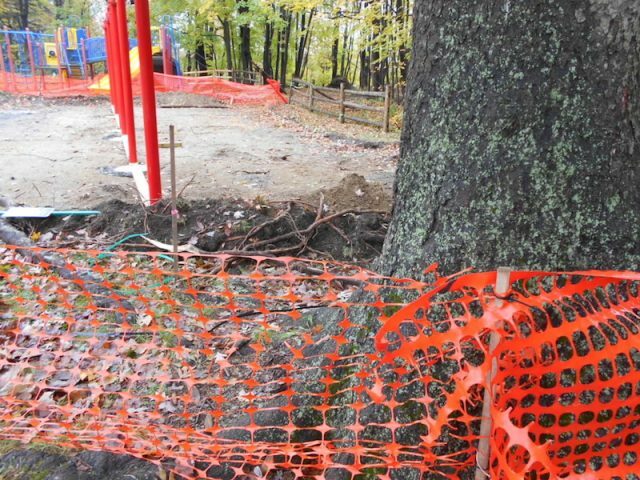 I’ve been waiting for decades for the Tree Committee to become more vocal supporters of Brattleboro trees, to come up with rules and permitting for cutting down trees and replacing them, and so on. The Tree Committee was out to lunch on this one as was the Rec Park coordination and planning to provide for the future Longevity and protection of these cherished shade trees that give the park much of it’s recognized character. These trees may look tough and they are, but when you start undermining/disturbing the very earth they rely on for stability while at the same time compromising (hacking away) a major portion of their established mature roots and their extending systems that anchor the Spruces’s towering structure from the pressures of high winds, it can directly lead to the trees’s rapid decline or complete demise in a blow over. 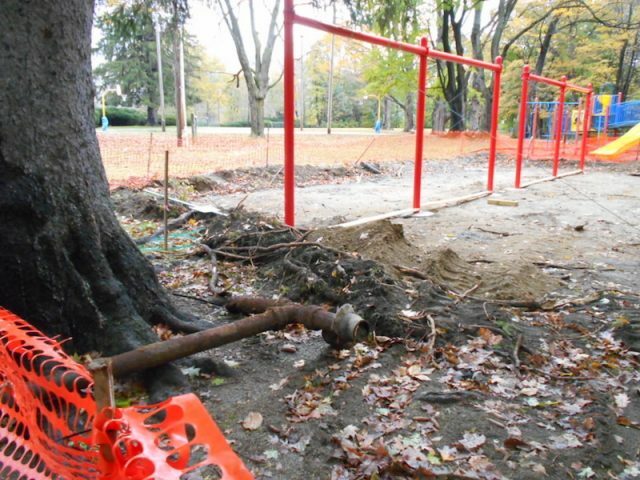 In this case the effects of excavation also presents an unnecessary hazard right over the newly installed play set that could have been easily avoided, to say nothing to respecting the value of this tree’s long lived stature on the Crowell Park grounds where it has in the past had ample space to thrive now somewhat replaced and deprived. Those who admire these old friends should not approve this kind of disrespect or blow to their chances of survival. These major roots severed, some at least 4″ in diameter don’t grow back in a day, especially with a long Winter yet ahead to survive and with what’s left for stubs now exposed to the elements. I used to think that the job of the Tree Committee was to preserve the magnificent trees that have taken years to achieve their status. Heaps of sawdust can cover up but not hide the severe damage already done to this elder evergreen I used to see kids playing around all the time looking way up into the towering tiers of branches above in wonder . What happened here is really not an acceptable treatment! What’s next for the park? or will we only know after such things suddenly appear and replace our open park space and sacrificing tree health in the process, who are it’s public protectors also taking lunch? 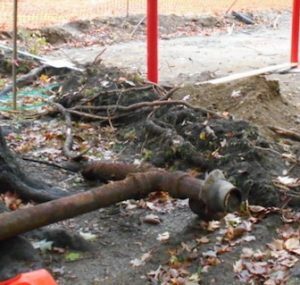 Kind of odd that the Town “saved” the trees from the potential damage of a skatepark, only to damage them anyway with a playground. Hi Chris, not sure I would give all the credit to the town’s effort to “Keep the Scene Green” at Crowell Park considering a 4 yr uphill battle involving no less than two community groups of intervention for preservation formed in succession requesting plans be properly vetted and transparent to public view while utilizing a legitimate assessment/evaluation process once absent through the town for those opposing many of the negative impacts to the park from the hastened pace to approve the concrete developments sited for and encompassing west end at at the time, where trees and open space would stand (or not) to be threatened(as you may remember brought to light by ibrattleboro initially). Many weren’t at home or aware on this one, never even heard of the proposal or plan presented myself!